WOYWW 156! Happy THREE YEARS! It’s the big one. Three whole years of WOYWW. Amazing. What a community we have built. The storms we have weathered, the friendships forged. It always amazes me the online outpouring of support from virtual friends who are virtual strangers. Julia’s recent posts regarding her dad and his health issue on holiday prove the point – am I right that it was a WOYWW participant who hooked her up with a translator? I think I am. How wonderful – the world of WOYWW is a small one, really. 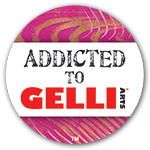 200 or so like-minded people who gather once a week to share their work, the mess on their desk, and sometimes little snippets of real life, outside of crafting. Beautiful gardens, scary weather, the loss of a friend, a parent, a pet. It’s all laid bare for us. And we commiserate, sympathize, laugh and gasp at the text, the photos, the snapshot of a life not our own. Such weekly riches. And Julia, bless her, who made the place for us all to gather. What dedication! FOR THREE YEARS, every Wednesday, without fail (ok so maybe the occasional timing glitch but I don’t know we have actually ever missed a day in al that time) she posts, she visits, she comments in a way that makes you know she actually read your post attentively, considered it, and commented on point. I’ve never made it to every single desk and yet she often does. Funnily enough it was a mistake, me meeting Julia in real life. You see I had sent an email to her, at some point, probably pointing her in the direction of something I thought might interest her. That got me in her address book and thru the magic of “predictive text” she mistakenly sent me an email aimed at another MARY about her crop in Ludgershall. As it wasn’t a million miles from me I asked that although I expected I got it in error would it be OK if I come along. and now, once a month, I get to hang out with the best bunch of ladies you could ever hope to meet. The serendipitous power of WOYWW. Magic. My desk, you ask? 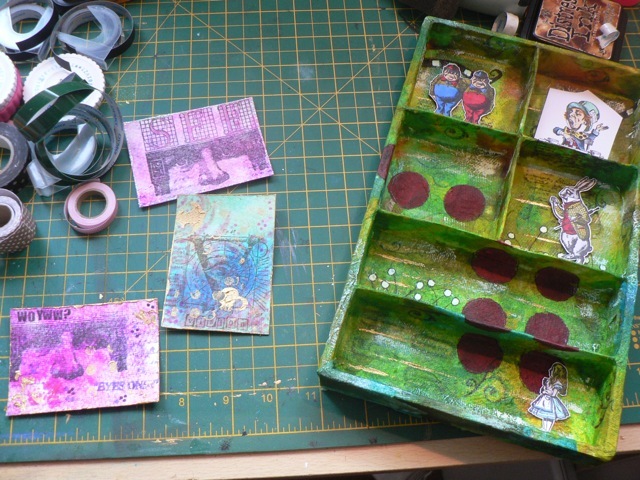 Well just a few things this week – You will see some of mt ATC play, using the ink-soaked paper towel – and I stress none of these are the actual WOYWW ATC, just a few random experiments I was playing with as I finalized my real one. 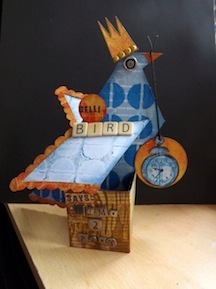 And a sort of configuration box, covered with other paper towels, and a few Alice stamps, coloured and cut, for a bit of a book/song mash-up that I have had in my head for a few years. I hope the close up shows a bit of the texture. The “eyes only” stamp is from work, many years ago, in my previous life as a classified documents librarian and researcher. I wish I still had the one that said “need to know only.” And eyes were a recurring theme of all my ATC play. Isn’t the paper towel base fab on the box? So there we go. Not as momentous a WOYWW as I planned, but a series of events have eaten in to my time, a bit. This, for one – DH is entering a chilli cook-off this weekend and needs some stall decor. 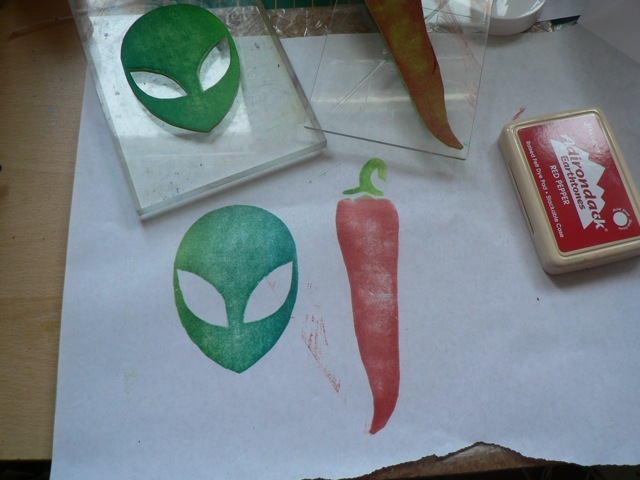 His batch, named Roswell’s Secret, needed green, aliens, and chillies so a quick couple of foam stamps were the order of the day. I’m off for a round of Drs. appts. for DD then it’ll be me, all stamping, all sewing, and all ironing for the day. I’ll be late getting started but dare I hope this is the week I make it to every desk? Who knows. Maybe it will be. Sorry to be so late getting round this week – the Queen’s Jubilee got in the way! So this means that the room of stash got a good straightening over the weekend, something that had been piling up since the holidays. Because I have some many different interests, organization is key to playing. Please don’t think I’m sick, sick, sick because of my manic desire to label everything. I think it’s just a carry-over of 30 years of filing habits as a teacher! Thanks for sharing – and happy WOYWW anniversary! Your paper towel background looks fantastic and I love that ATC as well. I hope your chilli cook off went well this weekend. Also loved the washi tape dymo idea, we gotta think outside the box sometimes. What a great post! I feel as if I need to take a vacation to the UK to meet all the fabulous people from WOYWW. I too, was a classified document custodian and we didn’t have the cool eye stamp but I might be able to come up with some others…… I’m now a classified matter assessor so don’t work with it any longer. Your Alice box looks great. I can easily see all the textures – very cool. I live in New Mexico and got a laugh out of the name of your husbands secret recipe! Very clever and hopefully his batch will get him a win! Love the atc’s on your desk so am looking forward to getting mine. That Alice box is something else – I love Alice and that is superb. Great looking stuff going on for the other half – wish him luck from me. you have written a lovely post and said what we are all thinking about this strange phenonenom that is julia’s WOYWW. I have been completely ‘sucked in ‘ since i started posting. I hope Julia reads your post. . . when she gets back from her hols that is … what a week to go away !!!! Love watching all those lovely ATC’s!! Ah-ha. The magical power of the internet. Love that story of how you met Julia. 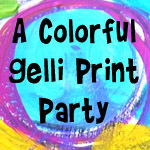 I’m just thrilled I was given the chance to “meet” you through this wild and fun blog hop we take each week. Happy 3rd WOYWW Anniversary from #2. Happy 3rd WOYWW Birthday! Great to be part of this wonderful fun group! Your post sims up the impact this group has had on our lives so poignantly. You’ll see on my blog and also Neet’s about a wonderful meet up we had with WOYWWers….. all made possible by joining in with Julia’s great idea. Happy woyww to you. Love the box and the ATCs. 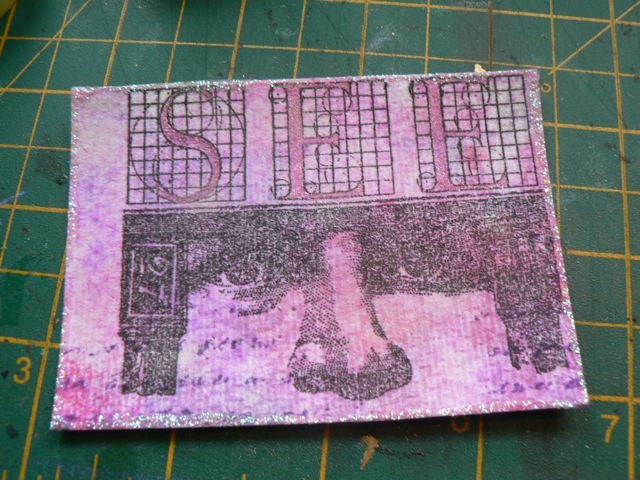 I used an eye stamp on one of my ATCs, let me know if you would like to swap. You summed up perfectly for me what WOYWW is all about – thank you. The chance to create links and friendships with folk that, ordinarily, I’d never have met has been wonderful and life enhancing. Hope you have fun swapping your ATCs!! Wonderful ATC’s and happy WOYWW! I agree, it is just fabulous how it has forged friendships over the 3 years. long may it continue. Helen, 8. Happy WOYWW Anniversary!! We must ALL thank Mrs. D for bringing us together! and a happy woyww 3 back to you too! Fabulous atc’s, would never know how to start! Love the little box too. 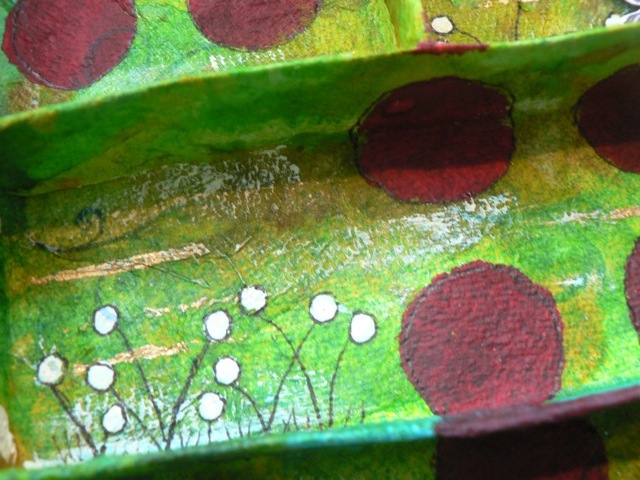 Paper towels are great for painting and sticking and covering up other things!